Workbooks and worksheets get a bad rap as mindless, rote busywork intended only to occupy kids and give adults a break. In my few years of living with a homeschooling mindset, workbooks have found their place in our learning and I owe a lot of it to Kumon Practice Books. In the beginning of trying to teach your child anything there always seems to be at least one large panic point, where you fear your child is waaaay behind and it is all your fault. That was the point in the journey with my oldest where I tried out Kumon's 'My First Book of TRACING' and discovered the very gradual nature of learning we often ignore or forget about. Especially at young ages, this learning isn't a race or full of legitimate deadlines. Learning is a process that we feed. "Kumon workbooks are based on the "Kumon Method", an educational philosophy that aims at unlocking the full learning potential of each individual child. 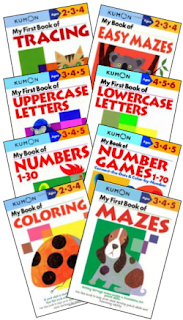 The Kumon Method introduces learning concepts in an incremental, step-by-step approach, allowing children to master new skills easily and without anxiety or frustration. As a result, children gain confidence in their abilities and are motivated to learn on their own." The illustrations are fun and vibrant with color. There are a variety of subjects and age levels available. There are clear, yet flexible age suggestions that makes it easy to determine its appropriateness for my needs. Price has been reasonable for a supplemental resource. Most importantly, every page builds on the last, making the skill building gradual and fun! There could be a better mix of games and writing practice as well as a larger number of games in the mix. Repetitive practice is important at certain skill levels, but a greater variety could be used to better engage the fast-paced learner. During the preschool years with my oldest, no matter what curriculum we were using, we would invariably get bogged down every 3 or 4 weeks (at least). Taking a break with one of these books always provided us with the change of pace we needed while laying foundation for another important skill. My son always celebrated and thought he was being rewarded when I pulled a Kumon book out!